After the long flight, a long road trip! Amazing what a good night’s sleep can do to improve your perspective! 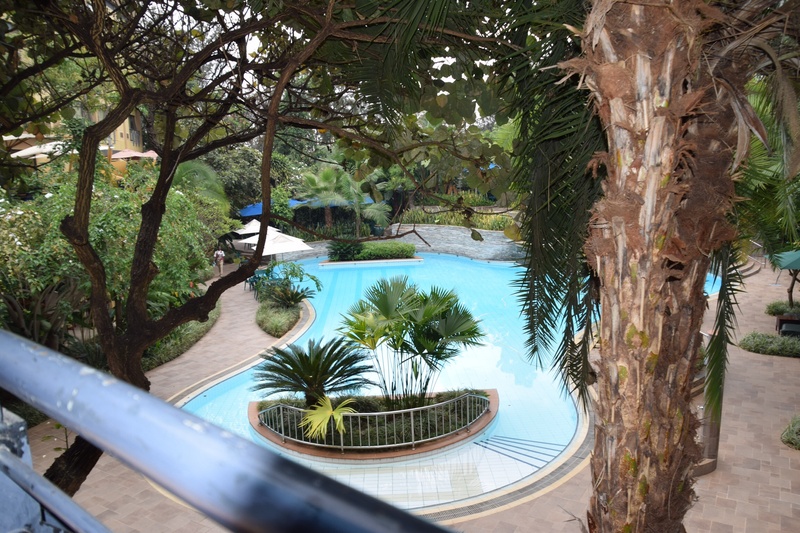 Saturday morning dawned bright at beautiful in our 5 star hotel high up on the slopes overlooking Kigali, and with this view from our breakfast table, it wasn’t difficult to recant my statement the night before that no, I was not happy to be back in Africa! 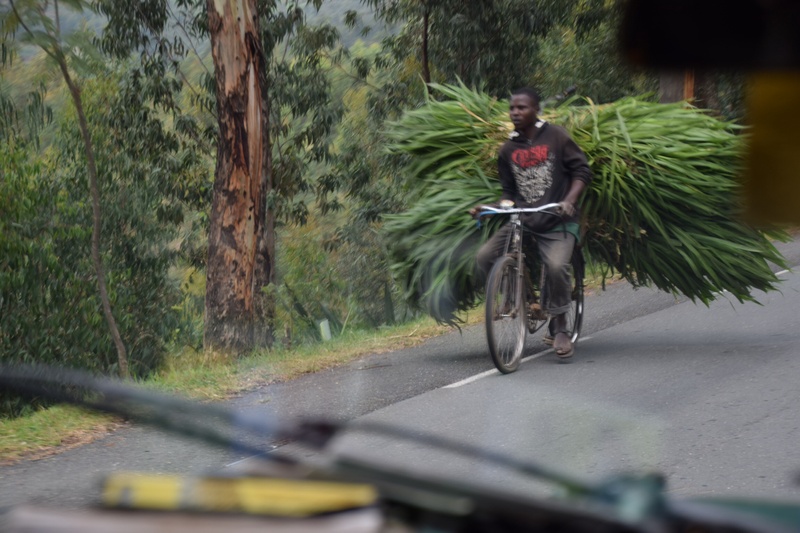 A quick repack meant all of Europe could be left in one big suitcase, along with Peter’s even bigger bicycle suitcase in safekeeping at the hotel, with just the hand luggage bags sufficient for our 5 days around Rwanda…. Literally, around Rwanda! Emmanuel, our guide, was eagerly awaiting us in reception, leading us proudly to the company vehicle that would be our transportation for the next 5 days. Perhaps at this point, I should digress to explain that when I made this booking, I rejected all the big foreign owned tour companies and settled for a local outfit who support local tourism and social projects (and it must be said, were very highly reviewed on all the travel websites I could find). Hmmmm… The “company vehicle” is a 4×4 as promised, and to say it has seen better days would be an understatement. Even as we sit here in Nyungwe, two days in, I am reassuring myself with reminders of Willy’s assertion that Toyota Landcruisers are indestructible, and the perfect vehicle from which to see Africa! 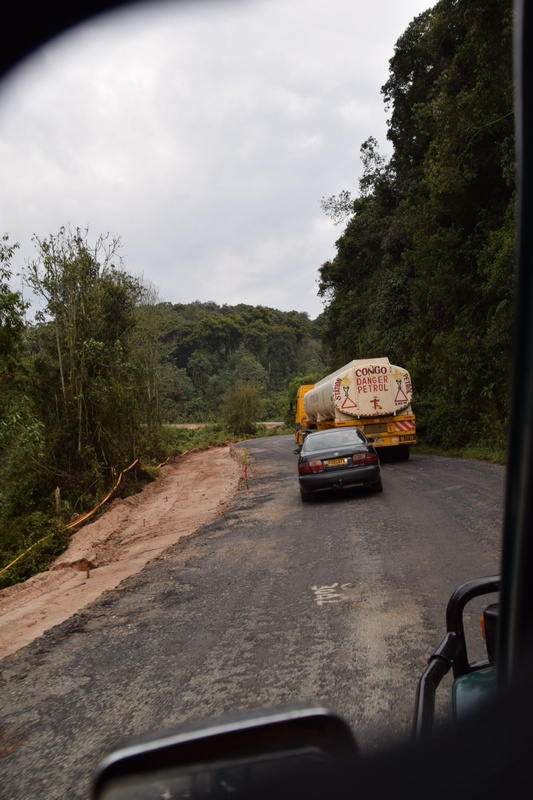 Just hope you’re right, Willy, because tomorrow we have a 10 hour dive up the western border along the Congo Nile trail, and this road is actually described as “bad” in our notes (while the truly appalling ones to date have warranted no such mention). It was only when I switched seats with Peter yesterday afternoon to sit up front with our driver that I realised how truly bad this car actually is. It has no clutch to speak of… If anything, the drivers clutch foot is getting a bigger workout than the accelerator / brake one! The wing mirror on my side is held in by some bent bits of flatiron. The front bonnet is held in place with rubber bands… Big ones, admittedly… And when we stopped to buy our park permits after driving through 2 hours of a road which can only be described as a massive work in progress, the driver had to open the bonnet to restart the car because the bumping had disconnected the battery! And then when we were stopped on a steep downhill by policemen wielding a speed radar device -along with their AK47s – apparently for going 5km over the speed limit, I suddenly realised that it’s a bit hard to know how fast you’re going when there is no needle on the speedometer dial at all! Quickly checked out that there is one on the fuel gauge! 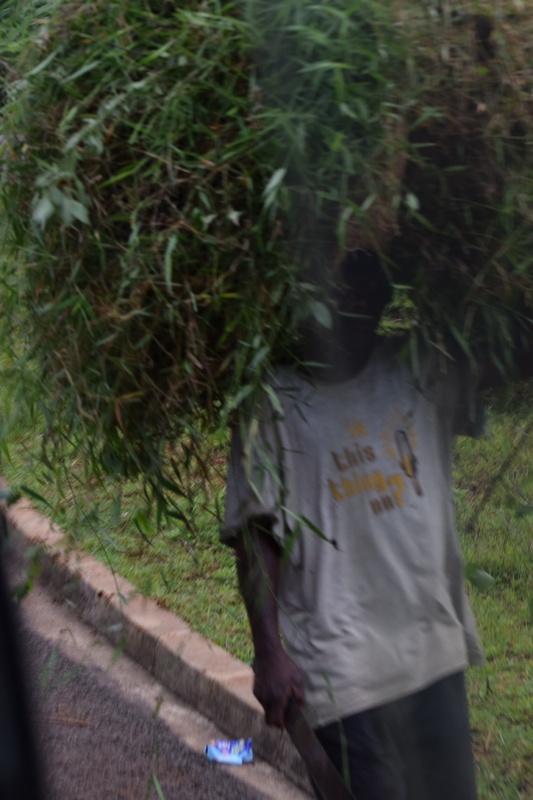 Our driver is Emmanuel – his name one of the many signs that this is a very predominantly Catholic country; all the way through to the rumblings about the wealth of the church and how much property they own, reinforced by his pointing it all out to us in every town and village! And of course, everything closed on Sunday, with even in the rural areas, roads and pathways thronging with people in their “smartwear” on their way, mostly on foot, to or from church services. Which brings me to the roads! I am reminded of Pip’s assertion that you can tell the difference between African countries colonised by France and Britain by the fact that the ex French colonies have reliable electricity, and crap roads, and vice versa for the British. Admittedly Rwanda was ultimately Belgian, not French, but they left behind the French language, and apparently the french approach to both electricity (a plus) and to roads (not so much). The roads are another matter entirely… Populated by 4x4s carrying tourists, buses of every size and shape carrying locals, bicycles carrying both people and “freight” – fire wood, bananas, sacks of charcoal, large milk cans, cartons and crates, all piled so high you can barely see the bicycle beneath- and of course people, people, people, sometimes they too hidden by their copious loads. 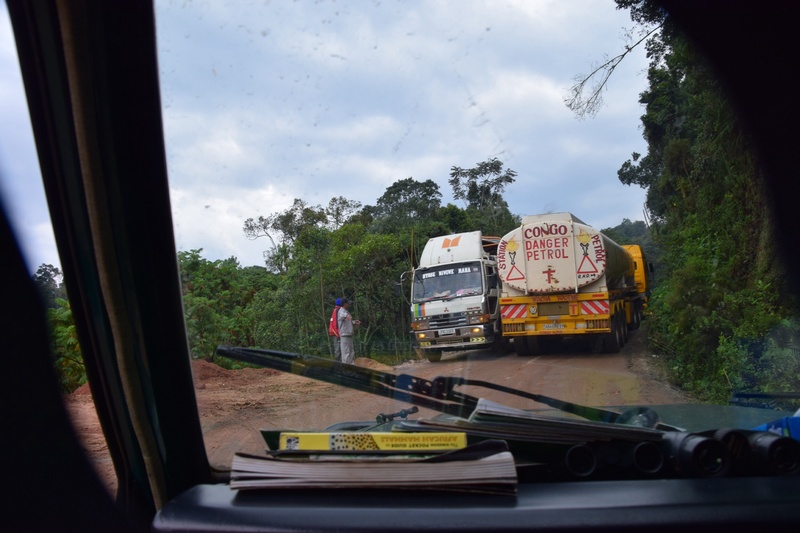 And then there are the container trucks and fuel tankers, carrying goods through Rwanda to Burundi (if not stopping here) from the ports of Tanzania and Kenya, a journey of a full month at an average speed of 8km an hour! Mind you, not that we are travelling much faster than that, except on the downhills of course, where according to the reliable police radar, we are reaching at least 54km an hour! 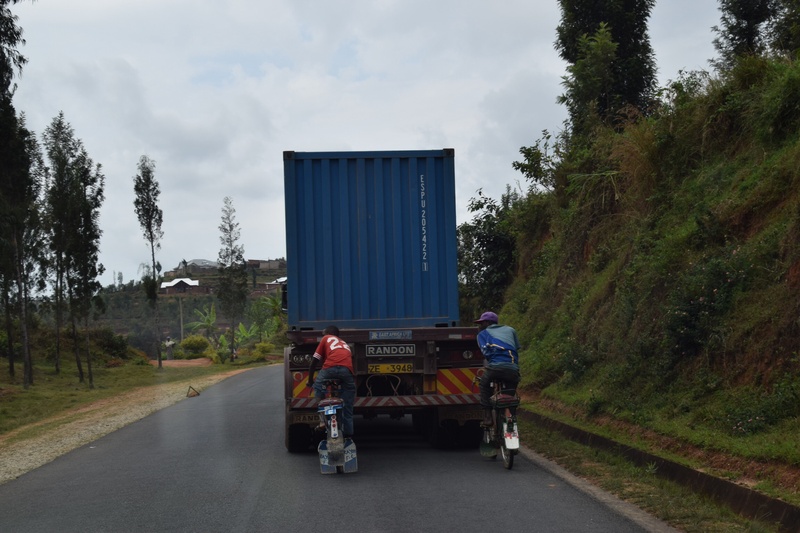 We notice two cyclists hitching a ride up one of the hills by holding onto the back of a container truck! The mind boggles! It is worth noting that the roadside verges… and, indeed, the country in general, is noticeably free of litter. A combination of the total nationwide ban on plastic supermarket type bags, and a law that says every citizen must spend the 4th Saturday of every month out on the streets cleaning up… Even the President, Emmanuel proudly pronounces. We leave Kigali just after 8am, the traffic light due to the weekend, we’re told, and with a brief stop at an ATM for local currency – in 5000 RWF notes, each about NZ$10, a real wad of money – we head southwest for Nyungwe National Park, via a couple of Museums intended to fill us in on the history of Rwanda according to the Rwandans, who seem very sensitive about foreign interpretations of their story. Probably most interesting was the visit to the noble ceremonial cows, with horns the size of large elephant tusks, who are kept only for show – their carer sang to them as we approached to keep them calm – no photos because I was slightly grumpy at the suggestion we pay double the museum entry fee if we wanted photos. Long way still to go so we stopped at a “supermarket” at 1pm for lunch supplies… Hmmmm, pretty much dry bread and a bottle of water. Fortunately Peter had some One Square Meals left from his cycling adventures! An hour later, we entered the National Park, and the road, which hadn’t been that flash to start with, basically disappeared! Roadworks of the most epic proportions, being worked on in no discernible order, with workmen at a different sit every few km, each with their own Chinese roading engineer and equipment. 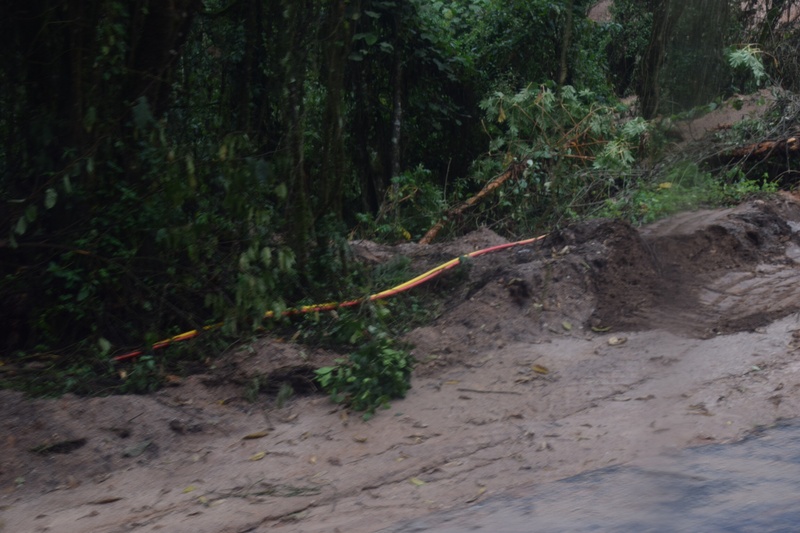 The task is difficult… It’s rainforest, it rains a lot. It’s also the only current route for said freight to Burundi! For two hours we travelled at snails pace, marvelling at the scale of it all, at the random stop-go arrangements, and the consistent red and yellow cable, the only common thread through all the work sites, carrying fibre to the regions, along with the Chinese road makers. Then just as suddenly as it started, it was over, the mud and rocks giving way to a perfectly formed smooth Tarmac road, with real road markings and all. 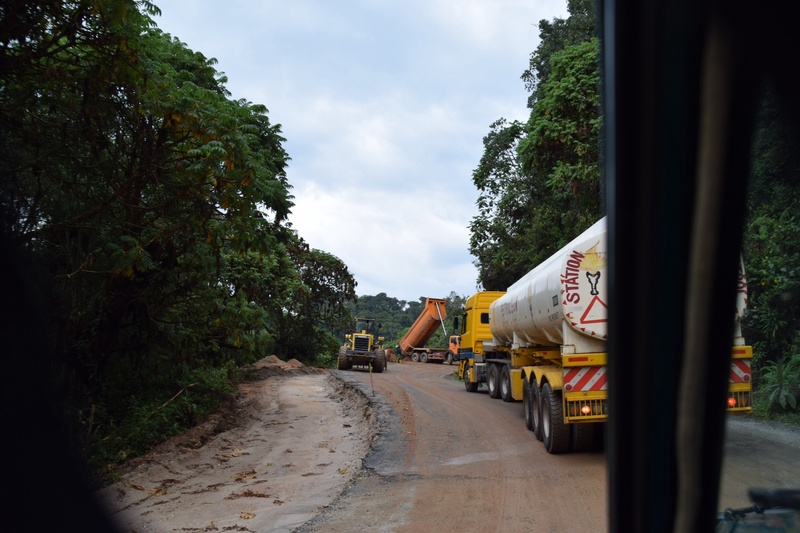 They have finished up to here, our driver s tells us…. Oh ye of little faith, I mutter to myself. Heavens they are actually going to get this road built (eventually). The prize at end of the journey? 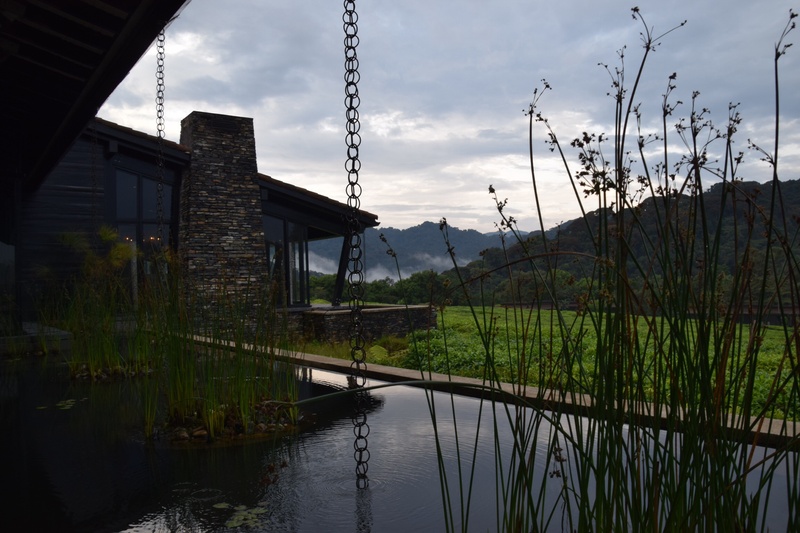 This ultra fabulous Ngungwe Forest Lodge – I am suddenly SO pleased I upgraded the originally suggested accommodation! No detail has been spare (or so it appears on first impression), right down to the sandblasted logo on every window pane – a monkey, of course. The warm welcome towels for hands and faces are followed by welcome cocktails and fruit kebabs while our driver briefs us on the fact we need to be at breakfast at 4.15am! I spare a fleeting thought for where he might be staying tonight as our lodge host whisks us off down the path in a golf cart to our home for 2 night…. Complete with a huge bath for wallowing in! Aaaaah, now this is the Africa I could become accustomed to! 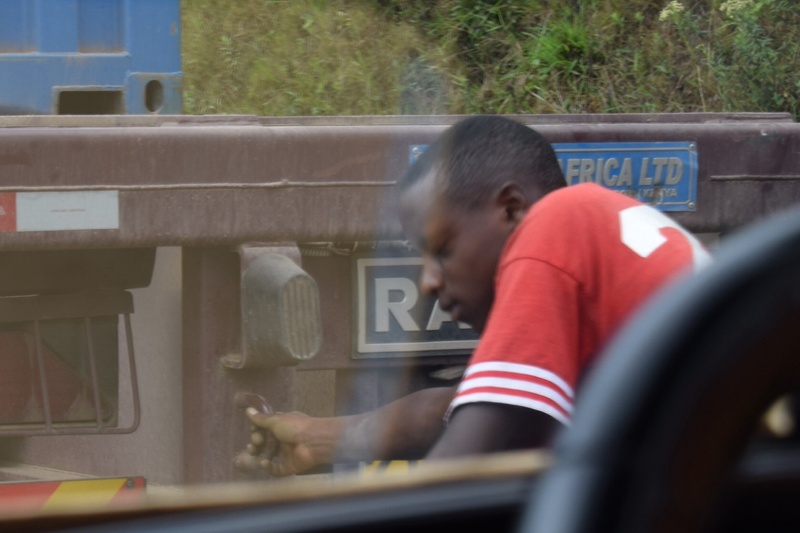 Enjoying hearing about your African roads – it is undoubtedly an exercise in both bravery and patience. Willy would say it could be worse than an old landcruiser, it could have been a landrover. All good here. Same old same old. See you soon. And the bath …. Truly the most welcome sight at the end if any day.